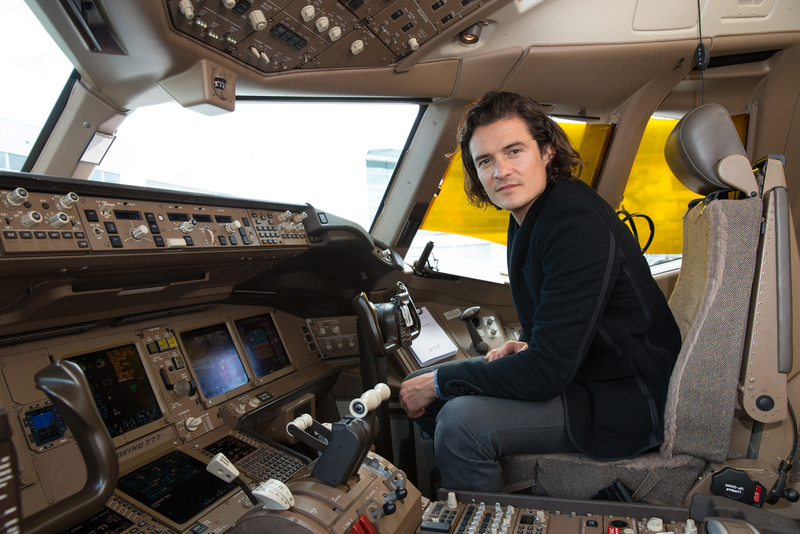 Orlando Bloom on board British Airways. Hollywood heartthrob, seasoned traveller and British Airways ambassador, Orlando Bloom reveals his tips and tricks to getting through long-haul flights. It’s a sunny Sydney morning at Sydney International Airport and Mr Orlando Bloom is in his final few hours in Australia, before departing for Los Angeles. However before he boards his flight with British Airways (he is an international ambassador, after all), Bloom takes time out to chat with an intimate group of journalists about getting through long-haul flights. Q. What are the ultimate travel necessities that you always travel with? A. Oh, well obviously my passport [laughs]. But I always have my iPad, a good book, I like a bit of old and new, noise cancelling headphones – which BA also have on board – and a scarf, you never know when it’s going to get a bit chilly. I like to be comfortable when I fly so I generally travel in a t-shirt and jeans. Q. What do you like most about travelling? A. I love exploring new countries and cultures and getting to spend time with new people really. Sometimes it feels like time travel almost when you get on a plane and then land somewhere completely different and you get to experience life in another way. What’s that saying? Travel broadens the horizons and broadens the mind. Q. What’s the best way to get sleep on a long-haul journey? A. Lie down, close your eyes [laughs]. I tend to drink quite a lot of water, and I try not to eat too much sweet stuff, although that’s always difficult because there’s so many tempting things on a BA flight. I try not to eat too much on a flight, stay away from caffeinated drinks and just relax with some in-flight entertainment. Q. How do you avoid jet lag? A. Jet lag can be tough to deal with but I find the best thing to do is to avoid alcohol, drink lots of water, and adjust your sleep to the time zone you’re entering. I try to exercise and get outdoors. If you’re arriving in Sydney and you’re lucky enough to get to the ocean and swim, I always find that’s a good way to combat jet lag. Q. Any tips for travelling with children on long-haul flights? A. Prayers [laughs]. Lots of praying. I’ve been very lucky my son has travelled quite a lot since he was little. We always have a few games and toys and few other small favourite things to keep him occupied. It’s probably one of the only times that it’s okay for an iPad to come out for a little while, you know, just to get through the challenging moments. To celebrate Orlando’s time in the country, British Airways is offering Australians up to 10% discount on all fares and special fares on its daily flights between Sydney and London Heathrow, via and including the award-winning Changi Airport in Singapore. For more information, visit www.ba.com or to book visit www.ba.com/partner-offer.